JK Tipper Services Ltd – Going for Gold! JK Tipper Services Ltd is a sub-contractor for Tarmac Industries which transports asphalt and aggregate materials. Established in 1997, Jk Tipper Services Ltd has seen a gradual yet significant improvement in their fleets KMPL and emission output since joining the FORS scheme. Managing directors of JK Tipper Services Ltd, Kuldip Gill and Jaswant Singh Sekhon, explain how FORS has been beneficial to their company. We discovered FORS online when we were searching for ways where we could improve on our driver training to help encourage their professional development within the business. After looking through the FORS website, we saw the wide range of e-learning resources available to drivers in our field of work along with the wide range of toolkits and guides. After reading some of the case studies from people who had similar aims and goals to us, we believed that FORS had to the tools to help us achieve the changes we wanted to make within the business. When working towards our initial bronze audit, we were able to see the improvements made within the business almost instantly. As we applied the new practices and procedures that were up to the FORS standard, we were pleased to see how easy it was to implement these better practices and how quickly they made improvements in the fleets overall operation. After achieving our bronze accreditation, we were encouraged to start working towards silver and gold accreditations with FORS to further improve our business’ procedures and practices. After achieving both a silver and gold accreditation with FORS as well as having a bronze accreditation, we saw that a lot of the improvements made from working towards our silver and gold accreditations were from our drivers. As we had our drivers complete the FORS cycle safety and security and counter terrorism modules, awareness of vulnerable road users and general road safety knowledge greatly improved. Moreover, the wide range of toolkits available on FORS was also very beneficial for improving the overall management of the business. The two toolkits in particular that proved to be very beneficial were the Congestion toolkit and the LoCity fleet manager toolkit. Using these toolkits in conjunction with each other helped lower our fleets KMPL and emission output levels. 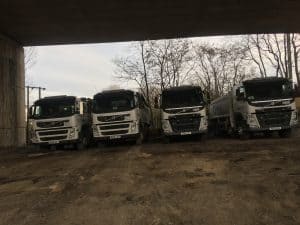 At JK Tipper Services Ltd, we believe that being FORS gold accredited shows Tarmac Industries that we are sub-contracting for them at a high standard and providing outstanding services to their clients. Furthermore, we believe that being FORS gold accredited will encourage our drivers to continue working at a more than satisfactory standard due to their efforts being acknowledged and rewarded. In the ­­­­­last twelve months, we have increased our KMPL by 12.32% thanks to FORS. At JK Tipper Services Ltd, we prioritise our driver’s health and wellbeing to avoid road accidents caused by human error. Prior to employment, we require our drivers to complete a health questionnaire form to ensure that they are fit to drive. If there are any health concerns, we will then refer them to a GP for further consultation. Moreover, we also request that drivers keep us informed of any new health issues that may occur during employment. When looking for new recruits at JK Tipper Services Ltd, we offer new drivers to the industry an opportunity to join our team by providing them with a two week training period prior to employment. Most companies similar to ours do not usually welcome drivers with zero experience in the tipper industry; however we have implemented the appropriate procedures to allow these new drivers to join the industry. After adding the FORS anti-idling method to our driver handbook, our fleets overall noise pollution levels have reduced along with our fuel usage levels, as this methods requires the driver to switch off their engine when idle for long periods of time. At JK Tipper Services Ltd, we carry out our operations in tipper vehicles that have a power turn over (PTO) system which is necessary for our mode of work. Currently, there are no alternative types of vehicles available which are suitable for transporting the types of materials we work with. We currently operate in vehicles with euro 6 engines, which are known for producing low amounts of NOx. At JK Tipper Services Ltd, we plan to keep on searching for alternative modes of transport that are suitable for our business. Furthermore, we will also continue working on our driver’s professional development by keeping up to date with any new courses or modules made available that are relevant to our mode of work. At JK Tipper Services Ltd, we believe that since becoming gold accredited with FORS, we have been operating at our most reliable and efficient level since establishing in 1997. In the future, we plan to continue working with FORS as we believe that FORS creates the best practices and procedures for freight businesses like ours to implement and carry out our work in a successful and safe manor.